Ten student-veterans and traditional students recently completed the month-long 2018 National Science Foundation-funded Trauma Research Education for Undergraduates (REU) Program hosted by Falk College. To enhance skills for conducting trauma research while increasing their ability to gain admission to competitive graduate programs, participants attended seminars on research methods and statistics, neurobiological, psychological, and physiological aspects of trauma, and research ethics as well as weekly self-care lessons and graduate school application workshops. Following a national review process, participants are identified and paired with experienced mentors from a broad range of disciplines. Through these efforts, students develop a hypothesis and perform statistical analysis of research data. Students will continue their research projects for the coming year, with the goal of presenting findings at a national or regional conference. Previous students presented at the annual meetings of the Eastern Psychological Association, Southeastern Psychological Association, and Association for Psychological Science. Participants who completed the June 2018 program include Casssidy Brydon (Florida Atlantic University), John Christopher (Tarrant County College), Ansel Gautam (Drew University), Brittany Hampton (Marist College), Tyler Johnston (University of Southern California), Erin Meyer (Cleveland State University), Wilmer Rivas (University of Southern California), Naomi Ruffin (Georgia State University), Matthew Ruhnke (University of New Haven), and Ian Troidl (SUNY at Buffalo). Project manager Ivan Castro, who completed the Syracuse REU program in 2012 notes that participants consistently report this opportunity helps them gain valuable graduate-level research experience prior to entering graduate school. When the REU program was launched in 2012, it was designed for veterans to create an opportunity to engage them in this content area. With only six veterans enrolled prior to the program start that first year, the collaborators decided to enroll non-veterans, which is an important facet of the continuing program. With spots for five veterans and five non-veterans, the program draws on personal experiences of veterans who understand the nature and context of traumatic events. Veterans are able to acclimate to an undergraduate culture with traditional undergraduates and are appreciated for their unique perspectives. Undergraduates see the benefit of knowing their study population because the veterans provide insight into their experiences. A joint effort by Syracuse University, SUNY Upstate Medical University and SUNY Oswego, the Collaborative Research: REU Site:Training Diverse Undergraduate Teams of Veterans and Non-Veterans to Conduct Trauma Research with Veterans project is directed by Brooks B. Gump, Falk Family Endowed Professor of Public Health. Professor Karen Wolford, who coordinates the interdisciplinary graduate certificate program in trauma studies at SUNY Oswego, co-directs the program. 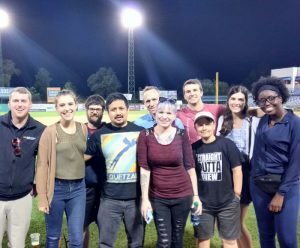 Supported by a National Science Foundation REU grant and Syracuse University’s Institute for Veterans and Military Families, this program spans one year, including the intensive four-week summer program in June. For more information, including details about the June 2019 REU Program, contact Ivan Castro at iecastro@syr.edu or visit traumaresearch.syr.edu.